Hyacinth orchid (Bletilla striata): growing, planting, caring. This orchid can be planted in open soil but needs to be sheltered. Bletilla striata - the hyacinth orchid - is a species of flowering plant in the orchid family Orchidaceae, native to Japan and China. It forms a clump 50 centimetres (20 in) tall with sword-shaped leaves and bright pink flowers in Spring. Each pseudobulb of Bletilla has 3 to 4 elongated, oval leaves reminiscent of lily of the valley. In the spring the stems carry clusters of flowers in narrow bells. 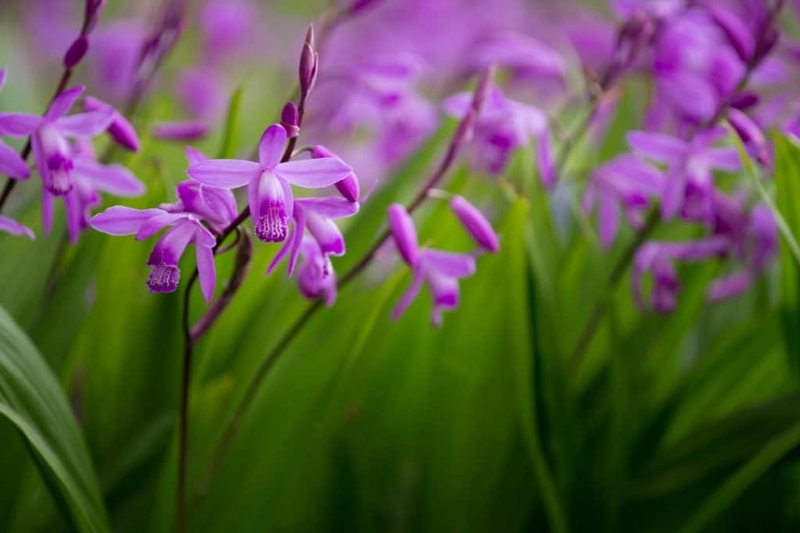 Plant the orchid of the genus Bletilla in cool, rich and well-drained soil, sheltered from the wind in semi-shade. Prepare the soil by possibly adding gravel drainage at the bottom of the hole if your soil is heavy. Then fill the hole with light earth, and plant the bulbils a few inches deep. Water to put the soil in contact with the bulbils. Water twice a week during the first month. Then, during the season, just check regularly that the soil is never completely dry, in which case your plant might need a little watering. In a mild climate, a good layer of mulch in the fall and you won't need to dig out your orchids for the winter ! Bletilla Orchid is prone to attack by aphids, whiteflies, mealybugs and spider mites. The most common treatment is spraying soapy water - which you should then rinse - for all these pests if you notice significant damage. Before deciding to treat: the predators of these parasitic insects follow the same cycles of population. So, if you systematically eliminate parasites, their predators die of hunger. This then facilitates an even greater proliferation of parasites. It's better to treat with moderation. This orchid does not tolerate frost, so if at home temperatures drop below 0 ° C, take out the small bulbs in October and store them in the shelter. In May, replant your orchid bulbs in their place.